Sydney’s #1 escape for the Easter Long Weekend! Enjoy the most amazing time of your life and experience the true surfing lifestyle! Become an expert surfer in just a few months, or launch your dream career as a surf instructor. Learn to surf & develop your surfing skills with some of the best coaches in Australia. Australian Surf Tours is more than just a surf camp in Australia. We represent a culture and a lifestyle. Connections between people and nature, people and the ocean and people with each other. There is something different about starting your life-long surfing adventure with Australian Surf Tours than starting it by yourself or with anyone else. We are energised by the ocean and the lifestyle that surfing brings. We pass on that knowledge and energy through surfing programs that educate and empower our ‘students’. Into the life the that they dream about. Surfing is not a sport, it’s a lifestyle. Our 7 day Arrival Package will show you just that we promise, whilst setting you up for your time in Australia. We pick you up from the airport; show you to your accommodation for the week, and provide everything else you need for an amazing time in Australia! “Choose a job you love, and you will never work a day in your life” Confucious. There has never been a truer word spoken according to the Australian Surf Tours team. Press play and see what we do! Our Surf Camp is a Surf Camp with a difference. We have been rated the best Surf Camp Sydney has to offer. You will experience all the joys of surfing on any one of our Surf Camps. We will add some Australian culture, a lot of passion and true surfing spirit to make sure your stay with us becomes a life long passion. You will feed kangaroos and giant stingrays. Jump off waterfalls and scale cliff faces. Visit a surfboard shaper, hang out with local Aussies and surf over 10 beautiful beaches. These are all typical days in the life of Australian Surf Tours. Australian Surf Tours is Sydney’s leading provider of Surfing Tours and Surf Camps. We offer you an unforgettable experience that you will remember for a lifetime. Our attention to detail is second to none, ensuring you have everything you need to make your stay with us beyond amazing. The locations we take you to are some of the most stunning on this continent and our staff are with you every step of the way! Check out the links below to find out why you should always choose Australian Surf Tours as your number 1 Surf Camp! At AST we believe in excellence in everything we do. Our surfing programs are therefore designed to maximise the involvement and enjoyment of our clients as well as to accelerate their learning. We believe that learning to surf (and everyone who surfs is always learning) relies on a holistic approach. For someone to truly develop their skills they require behind the scenes knowledge. This includes information about the ocean and how it works, why waves break in certain ways, what weather attributes to good and bad surf, how a surfboard works, surfboard design, timing and a whole host of other factors. Each one of our surfing programs have been meticulously designed to combine exactly the right ratio of theory and practice and are done in accordance with Surfing Australia’s standards of excellence. As our motto says, we are “More Than Just a Surf Camp” and we live and breath this belief. We represent what surfing and life means to us. Connecting with nature, enjoying and respecting the ocean and having fun with friends. Expect to be thrown deep into Aussie surf culture whenever you join a session with AST. From feeding kangaroos on our Weekend Surfari to aboriginal dancing on our Winter Surf Camp, camp fires, hanging at AST’s Beach Bar with our Surf Instructors or lounging around in the little Aussie surf town of Thirroul. At every chance we will immerse you in Australian surf culture…Why? Because we live it and love it and want you to as well! AST has two Surf Camp locations and ten beautiful beaches on which we run surf lessons including a National Surfing Reserve. This gives us options to make sure that our clients get perfect conditions everyday, and it also allows us to showcase some of Australia’s most amazing beaches and best waves. You won’t be confined just to one beach, we will find the best conditions and take you on a real life Surfari. Stunning beaches, national parks, epic waves and true Australian surf towns are waiting for you! Maybe the most memorable part of any surfing holiday is the people you meet on your trip. Maybe the most important piece of the puzzle when you are learning something new is your instructor. Well, not maybe, but definitely!! Your Surf Instructor is also your guide. They will take you surfing, teach you everything you need to know, discover amazing places with you, buy you a drink at the bar, sing songs by the fire and quite simply show you the best time that you have ever had. That’s what we pay them for! We have a selection of amazing characters that share our vibe and passion for surfing and Aussie surf culture that will make your time with us just as amazing as the stories they tell you and tips they give you. Our Surf Guides are professional, kind, funny and humble and they just can’t wait to meet you! Our commitment to our clients is more of a commitment to ourselves. Our commitment is to share our live’s, our town, our passion and our vibe with anyone who wants to share it with us. In doing this we think everyone deserves the best. So whether you are a backpacker or a traveling doctor, a young child of 5 years or a retiree we will tailor a surfing program suitable to you and give you the guidance you need to succeed and the love you need to enjoy the ride. You won’t find anywhere better. Surfing is more than just a sport. It’s a way of life. To truly develop your surfing you need to engage with the ocean, the people and the culture. Our 4, 8 and 12 week Surf Development programs take care of all of that. You will harness the skill of surfing through daily lessons, fitness sessions and theory. We will examine your surfing technique with regular video correction sessions. We will explore the movement patterns of turning through specific skateboarding and balance boards. You will be challenged and you will develop. To see more scroll down and select the course that suits you. “The lessons were extremely concise and insightful. Never had a problem following along during any session both in and out of the water. I’m sure you can get similar lessons in many camps, but you won’t get the same type of personality, attention, and care that the team at AST will give you. I’ve already recommended this camp to all my colleagues at work and many are signing up or have signed up and raved about it. As for the surfing, I don’t even know where to begin. 2 lessons per day, at different locations for different conditions, a video correction session, an amazing day trip to the Farm (the most beautiful secluded beach I have ever seen) and even surf-like skateboarding that really helped me understand how turning works. At AST Surf School having fun in the sun is what we are all about. 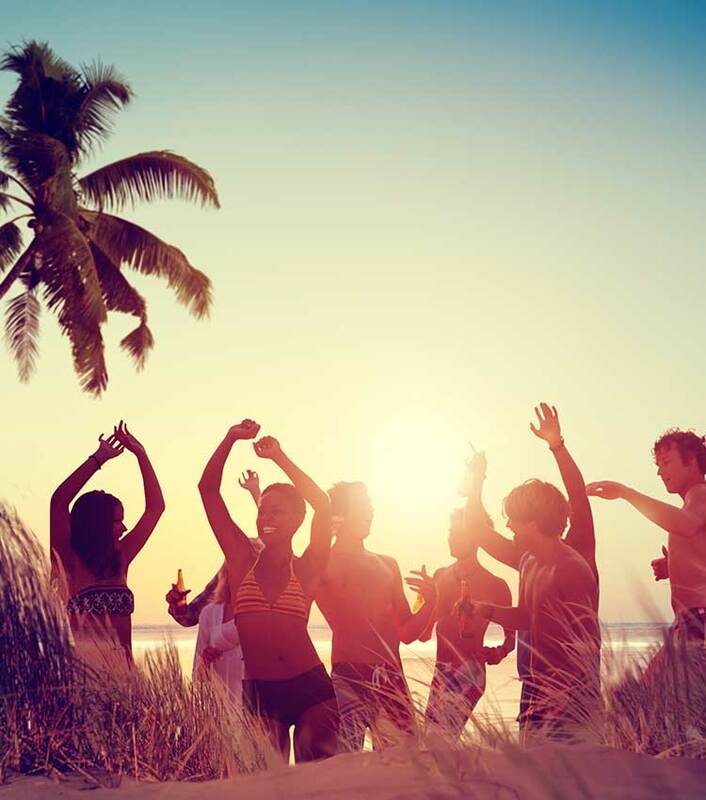 There is no better a way to spend your days than hanging at the beach with friends. Riding waves, staying healthy and just generally enjoying life. Here at AST Surf School we educate our customers and friends on how to get all this right! How do we know? We are professional beach bums! There is an art to it and we have mastered it. Learning about the ocean is a science and a necessity if you want to improve your surfing. It’s also how we stay safe while doing it. In a surfing lesson with AST you will learn more than just how to stand up. Our coaches are there to give you inside tips on how the ocean works and how to master it. This will help you enjoy your days in safety and have a barrel of fun along the way. If you want to learn to surf the right way, scroll down. Choose an option that suits you and let’s get out there together! Our Group Surfing Lessons are the best introduction to the sport of surfing. Whether you just want to give it a try, or you don’t want to commit to a full programme until the kids have given it a go, this is the option for you!!!! Group surfing lessons run daily at Bulli Beach. All lessons cover the correct surfing techniques along with a comprehensive introduction to beach safety and surf awareness. No stone is left unturned!! We operate Group Surfing Lessons at Bulli Beach. per person. Minimum of 5 people required. Private Surf Lessons are detailed and focused on an individual’s needs. Available for any level of surfer from complete beginners right through to competition surfers, these surf lessons will be designed on a case by case basis to maximise the learning curve of the individual. Our instructors will guide you, wave by wave, and give you a regular critique of your style so you can catch as many waves as possible and improve each time. Private Surf lessons are definitely the best way of getting the most out of yourself. We operate private lessons at 3 locations across the Illawarra. per person. Includes all taxes and equipment.